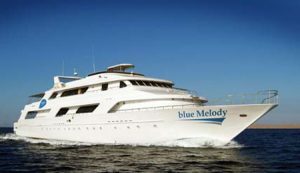 M/Y blue Melody is equipped with a nitrox membrane, booster pump and is re-breather friendly. M/Y blue Melody currently holds the DIVER 2012 award for ‘Live-aboard of the Year’ AND the Sport Diver 2013 ‘Best Live-aboard award!. Day 1 Start the week with a check dive before heading north for an afternoon and night dive. 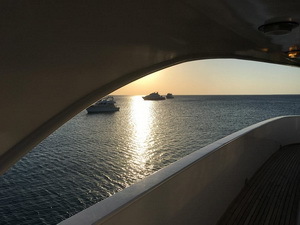 Days 2-5 – Spend four days cruising the northern Red Sea. Normally you will have the opportunity to make three day dives and a night dive each day. The exact itinerary and order of dive sites will vary depending on the conditions but you can expect to visit plenty of wrecks including Thistlegorm, Dunraven, Giannis D, Carnatic and potentially even more. There is also some fantastic reef diving including the Ras Mohamed marine park, Danaba (Shag Rock), Sha’ab El Erg (famous for dolphin encounters) and the Island of Gobal. Day 6 – Enjoy two relaxed morning dives close to Hurghada allowing you to cruise into harbor in the early afternoon. Take advantage of an evening onshore to purchase souvenirs and enjoy Egypt’s famous hospitality before your journey home the next day. This is a world renowned dive site, situated at the tip of the Sinai. Two small ergs are joined by a vertical wall dropping into the abyss. At Shark Reef the current allows you to drift along the wall, rich with colorful corals. At the gate of the Straits of Gubal is ‘Bluff Point’, which gets its name from the turbulence created by strong currents that beat the eastern wall of the island. The wreck of the ‘Ulysses’ lies on the reef 300m north of the lighthouse, starting at 5m and sloping to 25m. ‘The Barge’ wreck, south of the lighthouse, provides divers with a fun and unusual night dive. Also known as the ‘Ships Graveyard’, this reef is dangerously positioned close to the busy shipping lanes of the Gulf of Suez. This reef has claimed more ships than any other in the area. On the north side are four wrecks laying on a sandy seafloor at the bottom of a steep sloping reef layered with table corals. Wrecks here include the Ghiannis D, Carnatic, Tile and Lentil Wrecks.